We’ve all had leg cramps I’m sure at one time or another. Can diabetes cause leg cramps? Absolutely. But let’s define just what a leg cramp is first. A leg cramp or “charley horse” as we call them, is a sharp sudden tightening or sudden contraction of your muscle which can last for seconds or last for minutes. It usually happens in the calf muscle. They always happen at the wrong time, don’t they? For me, the worst is when I’m sleeping. That sharp stabbing pain just comes out of nowhere! OW! And when it comes you can’t do too much except to try and gently stretch the muscle until it subsides. I mean for years I’ve gotten leg cramps like most other folks and I’ve dealt with them. It’s just a painful “surprise” when it happens. If you’ve ever had them in bed in the middle of the night you know what I mean. The only thing that really helps me is to walk it off. It usually doesn’t last that long. But one thing that can really bring it on is dehydration so I always drink plenty of water! While diabetes is responsible for a number of issues, leg cramps can be one of them. The cramps and pain from the legs can occur and result from nerve damage known as diabetic neuropathy. If you get nerve damage in your legs or in your arms, it’s referred to as diabetic peripheral neuropathy. This results from prolonged high blood sugar levels. This is very important in catching and treating early to avoid further complications. Keep on top of this! Sometimes your nerves can become severely damaged enough that they may send signals of pain when in actuality there isn’t any. Diabetic peripheral neuropathy can be referred to as a minor setback of diabetes but people suffering through it would disagree that it’s minor for sure. *Leg cramps during the night: The cause may possibly be dehydration, low levels of calcium, or low potassium levels. But this could indicate possible nerve damage in your legs or feet. Have these levels checked. *Lack of coordination: You can experience a loss of coordination if your sensory nerves are damaged enough that your body is unable to know where the location of your particular joints are. In this instance, the complication of diabetes may wind up in your loss of sensory motor balance. *Tingling or numbness: If you experience any numbness or tingling in your legs or feet, it will feel as though they are asleep or a shocking or buzzing sensation. I experience this myself so I know. *Loss of touch: Since this occurs mainly in the hands and feet, people will feel as though they may be wearing gloves on their hands or stockings on their feet. And in addition, this damage to these much larger sensory nerves may also be responsible for loss to your reflexes as well. *Feet: Indications of possible peripheral neuropathy in the feet can be deformities, ulcers, joint and bone pain, and infections. You should be seeing a podiatrist to check your feet regularly. Some specific dietary supplements can help to alleviate leg pain and discomfort that are associated with diabetes. There are also some nutrients that may be responsible for protecting from any further damage and can help in repairing nerve tissue. *ALA- also known as alpha-lipoic acid is an antioxidant that is recently connected to diabetes. Diabetics take these supplements to alleviate pain and to possibly help any further damage to their nerves. *Vitamins B-12 and vitamin D- These vitamins can potentially help to promote healthy nerve functions in order to prevent damage. A deficiency in vitamin B-12 can lead to nerve damage. Vitamin D can also help to lessen the swelling that leads to pain. You can get vitamin D from the sun! Now you can also get the vitamins in the foods you eat but you can also take the supplements as well. If you are eating properly then you’re most likely getting the vitamins and nutrients you need. But in any event, you should always discuss this with your doctor first, especially if you are a diabetic and you are on medications. Make sure that you DO THIS! * Exercise- When you’re about to change up the intensity in your workout, whether it be jogging, biking, or training and your muscles are not used to the increased performance, you can experience cramps. You want to be careful with exercise and take it easy not to do too much too fast. Always warm up and step it up one notch at a time so that you lessen your chances of muscle cramps. *Dehydration- This just has to be the biggest reason for leg cramps. People who exercise a lot and of course athletes, go through the leg cramps all the time. This happens even more so during the summer when it’s particularly hot. Without sufficient fluids your nerve endings become sensitized and this triggers the leg cramps. The more that you exercise, the more you sweat and the more fluids you lose. You have to drink a LOT of water to stay hydrated. *Fatigue- If your muscles are tired from a variety of reasons, then you’re going to get leg cramps. Your fatigued muscle loses more nutrients than it uses so it won’t function at its peak. If you’re tired at night this can also set off the leg cramps. If your last workout was a hard one and you haven’t given your body and your muscles enough time to recover, you can experience leg cramps too. *Medications- Sometimes there may not be a cause of leg cramps that’s obvious to you. this may be the time to turn and take a look at what medications you’re taking. There could be blood pressure meds that you’re taking that can trigger cramps because they exhaust your body of salts and fluids. the best thing you can do is to discuss with your physician about your conditions and medications and perhaps make some necessary adjustments. *Deficiency in minerals- You not only lose water, you lose electrolytes too. This contributes to some serious cramps as well. Having an imbalance of magnesium, calcium, sodium, and potassium can set off these cramps. Eating right and sports drinks can help with electrolytes. *Standing and sitting- Standing or sitting too long can bring on cramps for sure. Your muscles are made to move so when they’re stationary they can cramp on you. If you’re standing and can move around every so often, do so. For me, sitting on the computer isn’t good either. I set my timer on my phone for 20 minutes and then get up and walk around for a few minutes. This way I’m moving at least every 20 minutes and experience less cramping in my legs. *Hypothyroidism- Leg cramps can also be caused by thyroid conditions. If you’re a person who has hypothyroidism, or who doesn’t produce enough thyroid hormone, and after a length of time that leads to damage to the nerves that act in sending signals from your spine and your brain to your legs and arms. Some experience leg cramps and others numbness and tingling. *Peripheral artery disease- If you don’t feel that your cramps are related to exercise, but seem to be unexpected you want to be sure that it isn’t coming from peripheral artery disease which is when cholesterol can clog up your blood vessels in your legs which obviously affects blood flow. Don’t guess and play doctor. Get it checked out! 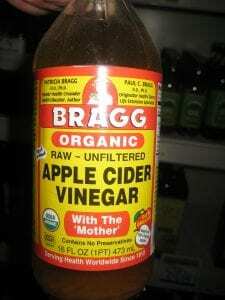 *Apple cider vinegar- Low potassium levels are one of the most common cause of muscle cramps. Apple cider vinegar in both unfiltered and raw is high in potassium. Many of the nutrients in apple cider vinegar help prevent dehydration by controlling the fluid balance in your body. *Rosemary- Rosemary can help in calming your muscle tissues that get inflamed and reduce soreness and pain. It does this because of its anti-inflammatory properties and speeds up recovery time as well. *Massage- Massaging your muscles with long strokes can help to ease up on the stiffness and soreness you may be experiencing. You can use essential oils such as peppermint oil or wintergreen oil. *Water- As previously mentioned, dehydration can be the major cause of cramping. Usually rehydrating your body can take care of the problem. Once you feel the cramp coming on, get one or two glasses of water into your body. If you’re drinking 6-8 glasses of water a day, then dehydration will not be the cause of your cramps. *Heat it or ice it- You can heat it to relax your muscles which will aid in dealing with tightness, pain, or cramping. Apply a heating pad or warm towel to the area to calm the spasms down. Lay these on the area and gently massage. Additionally you can apply an ice pack to the affected areas for pain and swelling. *Epsom salts- Warning about epsom salts! While epsom salts will help your feet under normal circumstances, they could make your feet worse if you’re a diabetic. Please check with your doctor first! Can diabetes cause leg cramps? Yes they sure can. While leg cramps are usually not a major health issue, you never want to “assume” anything. When it doubt, when it comes to your health, let the doctor know and make the decision. If you have neuropathy, this can help you in treating it! If you have any comments or questions, you can leave them below. i would appreciate your feedback. Thanks for reading and I hope that I have helped you with leg cramps and diabetes! I hear ya on the yo-yo dieting. It’s so hard to diet when food is calling your name. Congratulations on the curing of the diabetes. It’s something that should never come back. It can definitely be a cause of leg cramps too. They are so painful and if diabetes is the only cause and you cured your diabetes then you eliminated the leg cramps! Protein and all the healthy foods have so much with keeping diabetes in check. But exercise is equally important too. Thanks for the reply! So glad I read this info to help me with a healthier lifestyle! Thank you too Lauren! Onward to a healthier life! Thanks for the tips! Diet is hugely important and can be very tricky to tame sometimes. I recently got a new glucometer that automatically logs my readings into my smartphone which has been a big help in staying untop of my trends and keeping it in control. It can get really annoying but it’s been doing a good job in keeping me from cramping as much, since I stay more aware and can better predict when I’m entering dangerous territory. I’ll be sure to try the rosemary too, I think I have some in my kitchen so I’ll try it out and let you know how it works. Thanks again! Yes it’s all about diet and exercise most of the time and those nasty cramps just happen out of nowhere. That’s cool that you can get your readings right into your smartphone. Technology is amazing today. Keeping on top of your numbers is wise and staying hydrated also helps to prevent those cramps. Yes, give rosemary a try as well. There are many options to try. Hi Rob! Very nice article. I really enjoy reading it. I am a type 2 diabetic and boy do I have those cramps in the middle of the night! My worse cramp was while driving! I had to actually pulled of the road 🙁 Thanks for sharing all those information!